Turkish breakfast is very rich. Turkish people eat a lot of different things at breakfast. They do not like a simple one. It’s quite normal in Turkey to go to a restaurant or someone’s home for breakfast. Turkish people drink tea instead of coffee during breakfast. After breakfast, they drink Turkish coffee. Turkish people eat vegetables like tomatoes or cucumbers at breakfast. Also, olives are eaten for breakfast in Turkey. Simit (bagel-like pastry), cheese, and tea are Turkish people’s most favorite things in a breakfast. What to Eat at Breakfast? Cheese is a must; In fact, usually more than one kind of cheese is served. It also contains various types of foods such as olives, jam, honey, cream, butter, tomato, cucumber, assorted nuts, scrambled eggs with sucuk (Turkish fermented sausage), simit, pastries, etc. Usually, breakfasts are on weekends are richer. A breakfast always contains tea. It’s impossible to think of a Turkish breakfast without it. 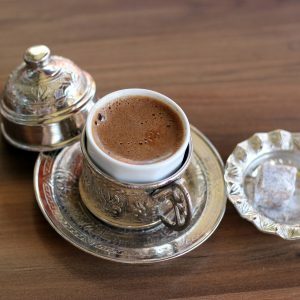 Turkish people are not in the habit of drinking coffee when they wake up in the morning. When they get up, the first thing they do is brew tea. Tea is brewed in a container called a “teapot” (teapot), and allowed to steep. Tea bags are not preferred. And tea is drunk throughout the breakfast. Turkish people love to drink tea in small glass cups. In Turkey, almost all homes have this type of cup. Tea is not only drunk during breakfast, but it can be enjoyed any hour of the day. Turkish people not only love to drink tea, but they also love to offer tea. In a lot of Turkish homes and businesses, they offer tea to their guests; It’s a tradition. At home visits, they also offer cakes, pastries, cookies, etc., together with tea. In some restaurants, waiters treat the customers with a glass of tea, sometimes even without asking first – because almost everybody drinks tea. 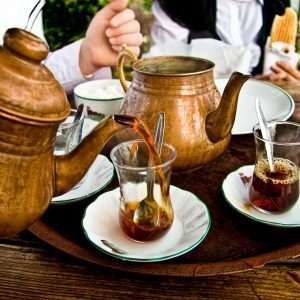 Especially after meals, drinking tea is a habit for Turkish people. Since then, we have had a great time with our friends and family. Especially on weekends, many of the restaurants in Turkey offer breakfast. People go to these restaurants with their friends and have a long breakfast. Turkish people love to chat with their friends while eating at a restaurant or at home. When they go to a restaurant, they just do not eat and leave; For Turkish people the aim is socializing, not just eating. And this is done at the dining table with long conversations. 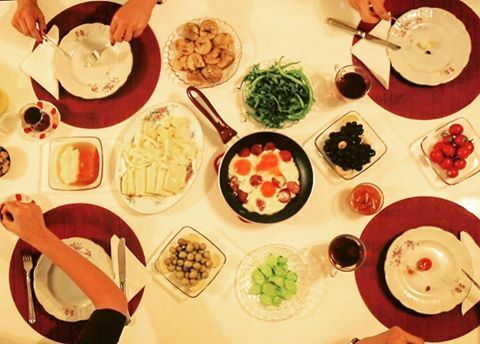 As in many other cultures, when visiting someone’s home for a meal, bringing a dish is a common practice in Turkish culture. This is also true for breakfast. We will talk about the “hospitality of Turkish people” and “guest / host behaviors” in more detail in the “Bairam visits” topic later.